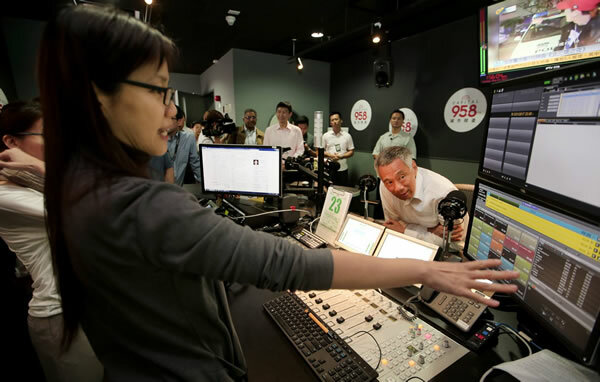 Singapore’s Prime Minister, Lee Hsien Loong, looks on as Capital 95.8FM’s Mary Bukoh shows how the RCS Zetta studio playout system is revolutionizing operations at Mediacorp’s amazing new campus earlier this year.When I first moved to Singapore in 2000, I was immediately impressed that every home in Singapore was wired with Internet broadband. The country embraces new technologies very quickly, as do the radio stations. Back then, two of the major groups, Mediacorp and Safra Radio were running Master Control DOS. Later they upgraded to Master Control NT and later to Version 15. Fast forward to 2012 and SPH Radio were awarded a new frequency and were the first station in South East Asia to embrace our latest Zetta and GSelector products on their new station Kiss92, (which celebrates its fifth birthday on September 9th ) and is now the Number 1 English music station in Singapore. Later, their other two stations also upgraded to Zetta and GSelector. In 2014, Safra Radio followed suit and upgraded both of their two stations to Zetta and GSelector. In 2015, Singapore’s largest media group, Mediacorp, upgraded the broadcast systems for their 13 stations to Zetta, GSelector and Aquira, ahead of the migration of their broadcast operations to their new campus which was started and completed in 2016/2017. So as technology advances, so do the features we provide in our products for the ever increasing desire of audiences on both radio and increasingly, other digital platforms. With a 100 percent market share of radio stations using our products in Singapore, we continue to deliver software that provides the functionality desired in this technology savvy City-State.